After the game, Abdullah told reporters that he might have been penalized because he slid and celebrated too excitedly, not because of the prayer. The safety said he told himself earlier in the game that if he scored a touchdown he would "prostrate before God in the end zone." 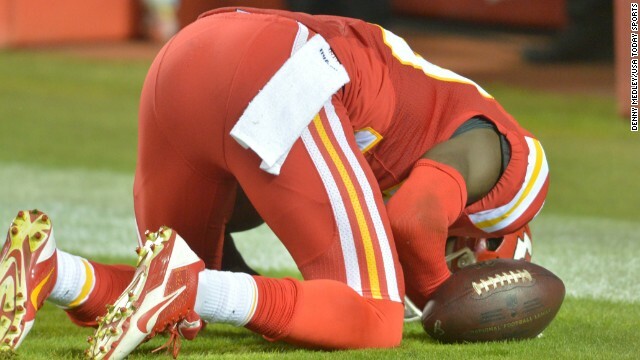 Abdullah's coach, Andy Reid, also said Monday that the referees told him the slide, not the prayer, led to the penalty. But online, Muslims flagged NFL referees for having a double standard. Others pointed out that Tim Tebow, an evangelical Christian, was not penalized for "Tebowing" - kneeling in prayer - during games. On Tuesday morning, Abdullah posted this photo on Instagram. Several years ago, Abdullah shocked his team by temporarily leaving football to explore his faith on spiritual journey to Mecca.